JoomHost is a nifty Joomla hosting template with the most advanced grid layout, crafted for the people who provide hosting services. It comes with multiple Homepage layouts as well as 7 different Header styles to give the website a unique look. Clean typography and precisely integrated the advanced tab section are two key strengths of JoomHost that have drag it and give a space outside of the crowd. So, if you are thinking to run a hosting business, it's the best kickstart to make your business profile live. Domain Searching facility is one of the vital things a hosting related business website should have, and the most important fact here is the placement. After we analyzed more than thousands of similar websites, we've picked up the best fitting place for the search module that makes it more meaningful. It entirely increases the elegance of the site and able to return instant result. JoomHost is the very first Joomla hosting template, comes supported with WHMCS. Its able to handle automatic billing including sending invoices, collecting payments, taxes as well as support ticket requests for clients incredibly from one place. It's compatible with all popular payment gateways like PayPal, Authorize.net, and Google Checkout. Unlikely most of our recently released templates, JoomHost - Joomla web hosting template has seven different header styles with different color variations in each. The combination of multiple home variations with 7 different header styles let you make the site extremely standalone in its every single portion. This Joomla web hosting template has 2 built-in Home layouts to choose from. Quix allows you to construct your site just by a single mouse click and it consumes a second at best. So, it's time you can avoid building the site from the sketch, pick one according to your best fit and get your site done next to your eyes. A uniquely designed extremely fresh looking smart tab switcher is used in its multiple homepages. It precisely combines sort of information in a way that can be looked over by the site’s visitors for sure. The switch between the tabs is tremendously fast, and at the same time, it ensures that it may not spoils the site loading speed. Pricing table is the part and parcel for a business website to make their client informed about the product pricing policy. Keeping this thought in mind, we crafted JoomHost - Joomla hosting template with highly clean pricing table section, and that's not limited to modifying. You can effortlessly modify or make the policy as per your requirements. Well organized layout helps the clients not to make confused a bit and creates an everlasting business value in the consumer's mind. Meaningfully crafted each section means you need not to build the site from the sketch, revolutionary page builder Quix allows you to build the site over a minute just by a single mouse click. 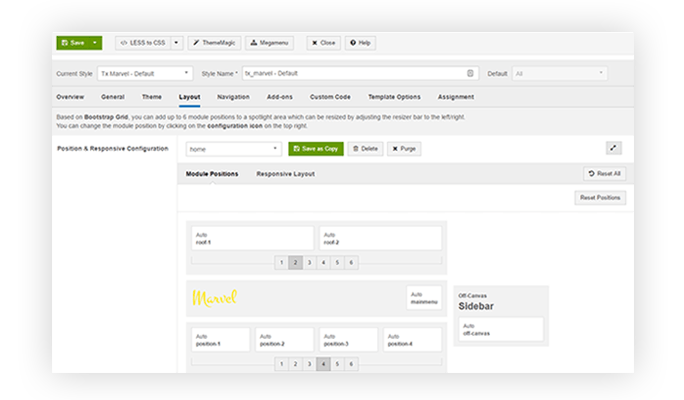 T3 framework comes with a built-in mega menu management system so you can easily create mega menu right inside template options panel with ease. Mega menu is much needed for modern website. You can host more menu and show them beautifully with multi columns layout. The section is designed highly focusing on the services you provide in your business. It can be the way how you make the clients informed about the special offers, your motto, individual products features and ensuring them they are absolutely safe dealing with you. Quix is a responsive first page builder for Joomla! help you to design beautiful page without writing a single line of code. Drag & Drop interface, easy column resizing, parallax motion, built-in animation, responsive controls are few unique feature that stat Quix truly apart from its competitor. Instead of spending too much time on Joomla cumborsome process you can spend much time building your business. The most powerful template framework T3, used to build JoomHost template. It gives you the entire control over you template layout, module positions, css/js optimization and much more. We’re always in reducing your trouble to ensure the ever flexible web experience. Therefore, we’ve set all the options you would need for building your site exactly right in front of your eyes. Nothing is complex here to get confused a bit and precisely used all the possibilities for effortlessly managing your Joomla site. You can change and customize layouts for all pages or assign them to a particular page as per your need. Responsive layout management with sub-layout options makes T3 the best in its competitions. Standalone team page is to let your clients introduce with the real faces behind your business. It helps to build trust and faith in their mind on you and your business policies as well. You can find your preferred font from thousands of Google fonts and make your own custom typography. Either you’re allowed to customize the font-family, weight, line height, letter spacing, size and much more to create an entirely unique combination. One Click Update button under the template typography option will let you find the most recent released Google fonts in just a second. Well organized and furnished full featured blog layout definitely amaze your readers with its widely used typography, proper use of color combination on texts, background, and links as well. The entire blog layout is designed obeying the standard manner including latest posts, recent posts, the number of members online and the necessary menu items on the footer. Every business website needs to expose the fact what people think about them, and it called the testimonial in terms of the web. It highly influences the clients having faith on your business. JoomHost comes with well-furnished testimonial section that need not be touched anymore while it pre-designed smartly. It can provide the testimony of people who have given a thumbs up including an appreciation text. Thinking to make JoomHost completely what you want? Of course, you can. The Theme Magic option allows you to make the template according to your own wish entirely. You can apply your own test of colors including preferred amount of padding and margin anywhere you think is best for your site. Changing the primary color is just a click anyways. Text typography, setting the transform factor, weight and all other properties are precisely used so that you never become a bit confused at all. We are a nimble team of designers and developers who are always ready for your support. No need for Customer Care people, because everyone is responsible for customer support here.